The Champions in this category are individuals, products, projects or organizations that have inspired STEM students to consider jobs in manufacturing (more detailed Champions features can be found in the 2018 Champions Yearbook). 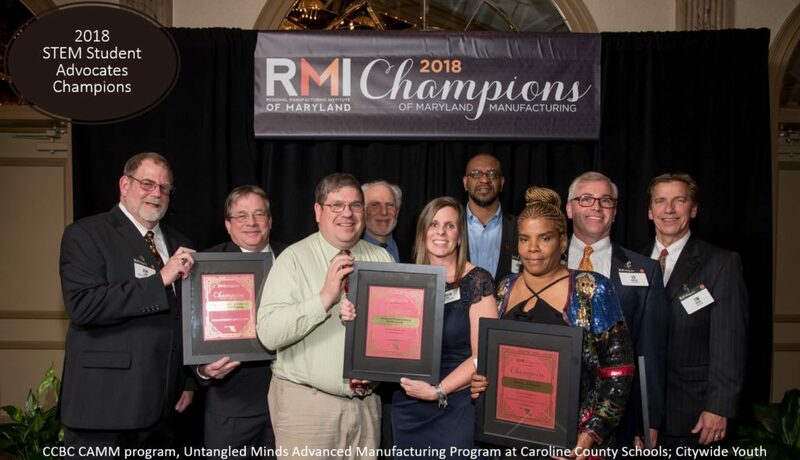 The Untangled Minds Advanced Manufacturing Production program at Caroline County Schools helps bring real-world experience into the classroom, providing a blend of modern manufacturing processes and soft skills training that employers need. Baltimore City’s Citywide Youth Development is a Baltimore-based non-profit, that uses entrepreneurship and manufacturing skills training and development as a crime prevention, poverty eradication, and community revitalization strategy. Baltimore County’s CCBC’s Computer-Automated Manufacturing program provides experienced and beginner level skills through hands-on projects and web-enhanced learning. Many students graduate with several job offers starting at around $35K. Baltimore County’s STAR Academy is Baltimore’s new technology training center providing an indoor training facility for using robotics, drones, 3D printing, virtual reality, and video game development to inspire imagination and develop 21st century skills. Prince George’s County’s Tracye Johnson of Local Motors, bridges STEM, the workplace, and education to manufacturing and technology careers for thousands of students through partnerships with Prince George’s County schools, colleges, camps, churches, and nonprofits.